This is the process of cleaning pockets in the gums to treat and prevent gum problems. Root planning is used to treat moderate to advanced gum diseases. When the gum is inflamed, gum pockets become deeper and they may lose connections to the bone inside. The deeper the pockets, the easier it is for plaque deposits to become trapped and worsen gum problems. Root planning involves inserting a pointed dental tool called scalers into the gym pockets to clean plaque buildup. 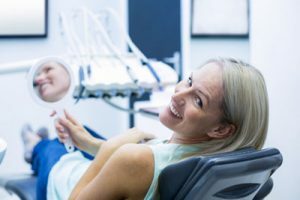 Depending on the degree of difficulty, root planning may take several appointments and a local anesthesia may be used to prevent pain. This is the last step in tooth cleaning and involves finishing the surface of the teeth to make them shiny and clean. There are two kinds of polishing: air polishing and rubber tip polishing. Air polishing works by spraying high pressured water mixed with baking soda paste onto the surface of your teeth. This powered water washes away residue and plaque while baking soda removes stains. Rubber cup polishing uses a low-speed and gentle handpiece that contains a polishing paste made of abrasive ingredients ideal for removing stains. The gums, ligaments, and bone around the teeth form the foundation for ones teeth. All structures are also referred to as the periodontium. When the periodontium is not healthy, it jeopardizes the teeth just as a bad foundation would threaten the stability of a house. Signs of unhealthy periodontium include: gums that are red and bleed easily, persistent bad breath, gums that are pulled away from the tooth, loose teeth, and changes in the position or bite of the teeth. Any of these may be a sign of problem. With proper gum treatments, however, it may be possible to return gum tissue to a healthy state. If you’re having a problem, come in and see us so we may treat it right away. The treatment usually involves a deep cleaning or root planing done under a local anesthetic, along with local antibiotic agents. If the gum disease gets too severe it may need to be treated through surgery or extraction. This is why it is important to have it treated at the first sign of a problem..
Veneers are a dental procedure in which a covering is placed over the outside (visible area) of the tooth. Veneers are usually only done to the part of the teeth that are visible when talking or smiling. The procedure can be direct or indirect.The direct technique usually involves placing composite resin on the outside of the tooth using bonding. This method is usually referred to as bonding. Our office offers two methods of whitening: in-office whitening and tray whitening. In-office whitening is an ideal procedure for anyone wanting immediate results. Because the entire procedure takes place in our office in about an hour, it is the perfect choice for busy individuals. In our office whitening we use Zoom! advanced power whitening system which is designed to provide treatment in three, 15 minute sessions, providing patients with exceptional bright white smiles. In this process, a protective gel is applied to your gums to protect the soft tissue. A special light-activated gel is then applied to your teeth and a special light or laser is used to enhance the action of the agent. It is important that a missing tooth be replaced as soon as possible for several reasons. If not treated the teeth surrounding the gap begin to shift inward. Since teeth use their neighbors for support, if one is missing they begin to “fall” and shift into the open spaces. This may worsens the bite due to changes in pressure and can eventually result in problems with the jaw such as TMJ. Bridges and crowns are made by first taking an impression of your mouth. The impression is sent to a dental lab where your crown or bridge will be custom made to fit your mouth and match your natural tooth color. A temporary crown or bridge will be placed into your mouth until your permanent crown or bridge is made. When the permanent crown or bridge is ready, it will be cemented into place. A removable partial denture is a device used when one or more natural teeth still remain in the upper or lower jay. They usually consist of replacement teeth attached go a gum-colored plastic base which is held in place in the mouth. A fixed partial denture acts the same as a removable denture, but it is cemented into place using the adjacent teeth for support. This fills the space created by missing teeth, as well as creates a support for remaining teeth to prevent shifting. New dentures may feel awkward or loose for the first few weeks until the muscles of your cheek and tongue learn to keep them in place and you are comfortable eating and speaking. This may require some practice, but soon you will adjust and enjoy the benefits that a full mouth of teeth can provide. It is critical to keep the extraction area clean to prevent infection. We will provide you with dry, sterile gauze to bite down on for 30-45 minutes to limit bleeding while clotting takes place. For the next 24 hours, you shouldn’t smoke, rinse your mouth vigorously, or brush teeth directly next to the extraction site. A wisdom tooth extraction is a relatively routine procedure. After the tooth (or teeth) is removed, you may be asked to bite down softly on a piece of gauze for 30 to 45 minutes after you leave the office, to limit any bleeding that may occur. Some pain and swelling may occur but it will normally go away after a few days; however, you should call your dentist if you have prolonged or severe pain, swelling, bleeding or fever. As your child nears age 6, the jaws grow, making room for the permanent teeth. At the same time, the roots of the primary teeth begin to be absorbed by the tissue around them, and the permanent teeth under them prepare to erupt. The first permanent molars usually erupt between ages five and six, so they are sometimes called the six-year molars. Because the six-year molars do not replace any primary teeth they are often mistaken for primary teeth. You should remember that they are permanent teeth and must be cared for properly if they are to last throughout your child’s lifetime. These molars are especially important because they determine the shape of the lower part of the face. They also affect the position and health of the other permanent teeth. Your dentist may recommend that your child use an over-the-counter fluoride mouth rinse daily after age six. Be sure to instruct and, if necessary, supervise your child in the use of these mouth rinses. By age 7, your child should be able to brush alone. Flossing, however, is a more difficult skill to master. At about age 8, the child should be able to floss his or her own teeth under your supervision. Sometimes a primary tooth is lost before a permanent tooth beneath it is ready to erupt. If primary teeth are lost too early, nearby teeth can tip or move into the vacant space. When the permanent teeth are ready to come into the mouth, there will not be enough room. As a result, they may erupt out of their proper position, leading to malocclusion. To avoid such future problems, your dentist may recommend using a space maintainer to reserve space for the permanent tooth. If a primary tooth does not fall out when it should, your dentist may recommend that it be removed to prevent the irregular eruption of the permanent tooth.